Gowarikar(1989) developed parametric and multiple power regression (MPR) models with 15 predictors for LRF of AISMR, which were later modified in 1991 to include 16 predictor parameters. The parametric model is qualitative and indicates the likelihood of the monsoon rainfall to be excess or deficient. Thapliyal (1990) evaluated the relative performance of multiple regression, and Navone and Ceccatto (1994) have used 'feed-forward' neural network technique for the prediction of Indian monsoon rainfall with two predictors (500 hPa ridge location and Darwin SLP tendency from January to April). Most of the studies on LRF of Indian monsoon rainfall were based on empirical or statistical techniques till 2010. IITM, Pune has recently implemented the state-of-the-art coupled climate model, the Coupled Forecasting System (CFS) developed by the National Centers for Environmental Prediction (NCEP), USA. These statistical techniques range from simple correlation analysis to advanced procedures. Vagaries leans on, and believes in the "Gowarikar Method" with 16 parameters. The results of this old but proven method has been successful. For Vagaries' forecast and analysis made in the "Arrival and quantum Monsoon Watch" series, I combine a few of them alongwith Dynamical models for a personal analysis and estimate. 15 initial parameters from the months March, April and May are used to analysis and forecast the simulation of Indian monsoon rainfall during June to October. These initial conditions were carefully selected to span the evolution of both the atmosphere and ocean. We have to take into consideration most of the 15 parameters (Gowarikar Method) before making an assessment, and these have to be analysed one by one. The prominent among the 15 are , ENSO, March temperatures of North India and East Coast, Himalayan Snow cover till March and SOI to name a few. Calculating the amount of rainfall, region wise, is of utmost importance, as SWM contributes to almost 80% of the annual total rainfall over India. In this article, Quantum Analysis is evaluated for the amount of summer monsoon rainfall over Indian monsoon region during June to SWM withdrawal. The 500 hpa parameter is of importance in April. The mean latitudinal location of the 500 hPa ridge along 75°E in April over India, first identified by Banerjee (1978), is considered to be one of the most important predictors. The mid-tropospheric anticyclone over southern India migrates from 11.5°N in January to its northern most position of 28.5°N during July. From October, the ridge starts shifting back southward. A more Northward location indicates better performance of the monsoon and vice versa. It also showed that the negative correlation of the March ridge was more dominant with the monsoon rainfall of the peninsular India, while the positive correlation of the April ridge was more dominant with the monsoon rainfall of Northern India. variability of Indian monsoon. Unfortunately, getting an accurate, or near to accurate forecast of the ENSO for the next 2 months is difficult, with no guarantee of accuracy or performance surety. We see weak El Nino conditions persisting. But, there is a possibility of a Neutral event occurring as early as July. Now, this would result in recovery of Monsoon condition from mid July or August. (Without a "Break Monsoon"). But I would not endorse the event as yet. I would give it a 50-50 chance. We depend also on other parameters. Normally, Pulses from the Eastern Pacific area, that is S.China sea, would mean depressions and systems originating from the Bay. 'In Situ" systems and systems from the Far east would contribute to the rainfall to the east Coast thru Central India and into Gujarat and even into Sindh (Pakistan). El-Nino, even a mild one, would sort of restrict these pulses, and in fact encourage WDs into coming down south, more South than normal. This may persist till June, and then rapidly the flow of systems should increase from Bay in July. The performance of Vagaries' Monsoon Watch Quantum Analysis is evaluated for the amount of summer monsoon rainfall over Indian monsoon region during June to SWM withdrawal in 2 phases. (June/July and August/September). 2)... August and September ..this is tentative and will be published in first week July. i) Monsoon advancing from Kerala thru upto Central India, and into NE States and West Bengal. ii) Heat ( Normal to above Normal) in Northern India, and Pakistan. Monsoon advances into Central India and North India between 20th - 30th June. iii) Monsoon moves into Pakistan around 5th - 12th of July. B) Mid June to July end, we can see normal rainfall and progress of the SWM in all of Sub-Continent regions. Weak Nino conditions in the Pacific Oceans will send a few "pulses" to create "in situ" systems in the Bay, and the first 2 months could see around 3/4 noteworthy systems traversing the Sub continent. WDs will be few, hence, we can expect a few systems to track towards Central and Northern India, resulting in good rains in the plains of N.India and Northern Pakistan regions..and fairly good above normal rains in Nepal. This estimate is based absolutely on the situation as it shows and stands today. These are my personal views, and should not be depended upon commercially or otherwise. They may differ from other models. Rajesh sir If possible can you provide the rainfall estimate for Surat for the June month?? Shitij: Very difficult to give specific town amounts, that too 30-60 days in advance. In fact, i dont think any agency or Met Dept gives amount of rain forecast...But wait..I'll try. Surat i estimate can receive 225-250 mms in June and 440-460 mms in July.Shitij, please come for our next meeting in June. Nilay: Thanks...I would like you to attend our next meeting , which I propose to hold in Jume. Sir can you update the monsoon progress uptill now. Reports confirm of light drizzles in parts of Mumbai on Friday 20th and Saturday 21st Night. Sir, there is an adverse effect of Western disturbances on the monsoon,how and why? Also like to know about the relation between seasonal low and western disturbances? Rajesh sir,do you think that it would rain below normal in our area and most of the country in june?What rainfall estimqte do you have in amount for pen,roha regions?please tell. megh kapale: Now, the SWM has moved into the Andaman region in the Bay Branch.Let us concentrate on Arabian Sea Branch now. Strong cross equatorial winds are blowing, and we see moist winds upto upper levels as Westerlies around Maldives and South Westerly off Sri Lanka region. We also see cloud masses in Central Arabian sea forming due to the somalia effect. ( See MW-3 and MW 4). We can possibly see SWM progress into Maldives in next 3/4 days. Nilesh: WDs are "diverters" of our Monsoon Lows from the Bay. A WD will normally, with a Southerly Low, divert an incoming system (Depression) from the Bay towards NE, and prevent a direct inland track to Central India. No direct relation between Seasonal Low and WD, but a strong WD is not favourable to the Low. Also, a strong seasonal Low , can "push" a WD if it is weak towards NE. abizer: I have said Kionkan will get Normal to above Normal rainfall in June and July. Could be excess by 10%. 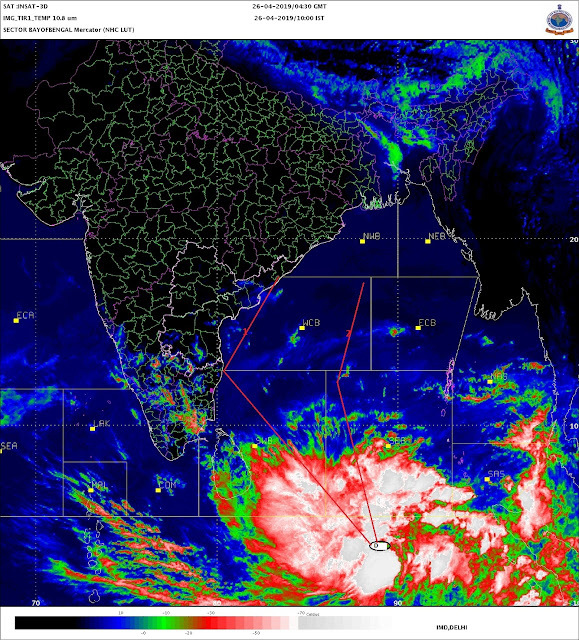 Rajesh Sir, any chance of cyclone formation in the Arabian Sea in the coming days...like last 2 years? shryas: No cyclone forming in Arabian Sea. A trough off the west coast is forming. Expecting upper level westerlies to strengthen along west coast. Thank you sir for your prompt response. So hopefully we may see a good performance from the Arabian Sea branch of monsoon this June. Thanks alot sir for giving the rainfall estimate for Surat sir. Writing to you after a long time. When is the intense heat in Nagpur going to subside. Rajesh sir When can we expect rain in Surat? ?